This one is another stable soup of the Russian cuisine, and like everything else it comes in many varieties. The main component of Shchi is cabbage, however it can be fresh or kislaya (sauerkraut), and the rest of ingredients depend on which type you use. 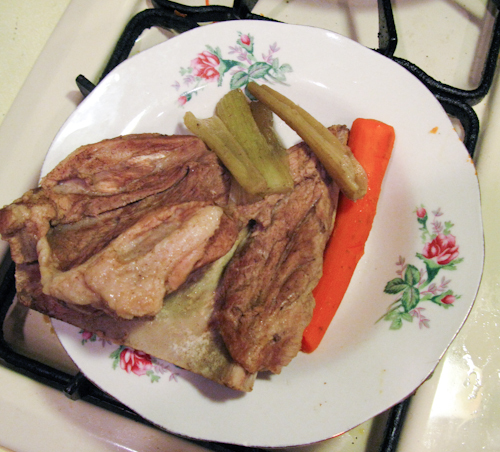 My family uses meat broth as the base, though I’m sure you could substitute vegetable broth as well. 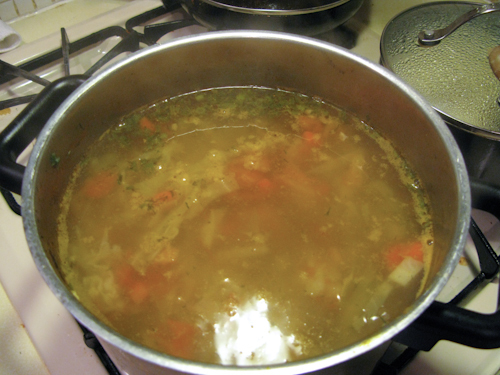 If you’re starting from ready broth, this is actually a really quick and easy recipe as well. You can follow directions for making meat broth on the Borscht recipe, or start with your own ready broth. 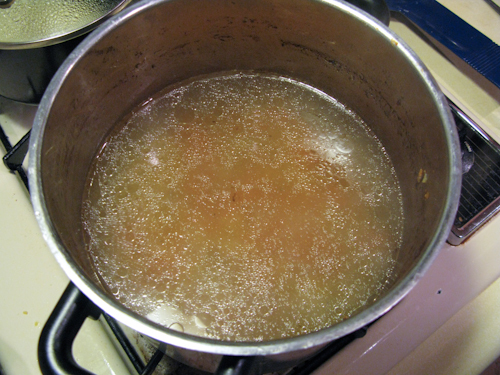 We start with about 8 cups of broth, and adjust by adding water as needed. Starting with the broth, bring to a boil and lower the heat. 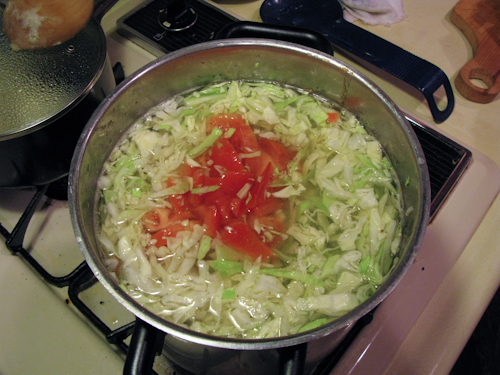 Add the onion, carrots, celery, potatoes, cabbage, and the tomato. Add all the seasoning except the dill, and adjust the salt to flavor. 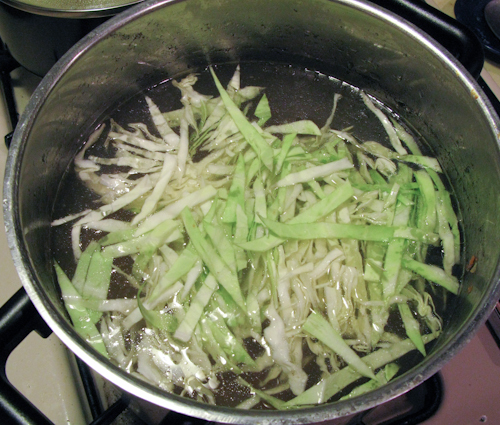 Allow the soup to cook for 20-30 minutes at a simmer. 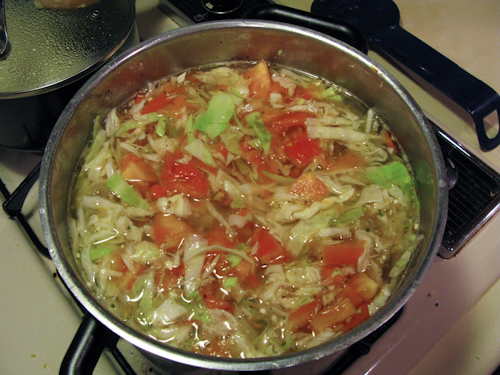 The cabbage should be soft, and the tomato should almost completely be dissolved. Add the fresh, chopped dill, and the table spoon of butter. 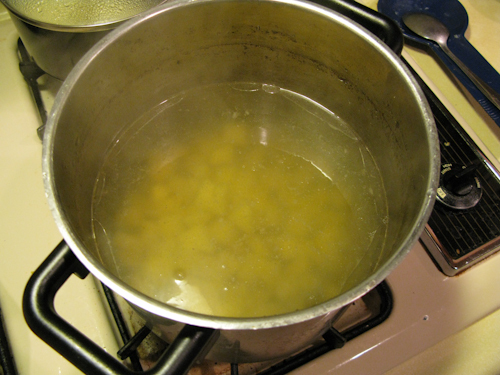 Cook for an additional 5 minutes, or until the butter completely dissolves. 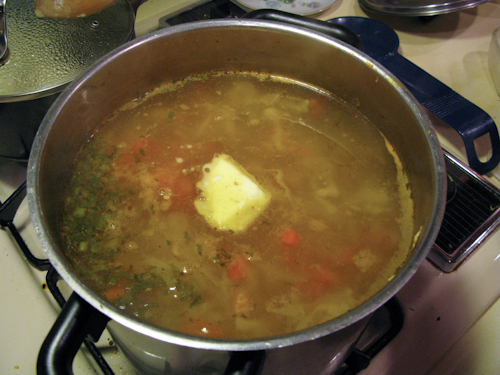 I don’t recommend skipping on the butter, it adds quite to the flavor when making the soup with fresh cabbage. Serve with a table spoon of sour cream and Enjoy! Posted in: appetizer, Beef, meat-less, Potatoes, Soup. This reminds me of my grannie’s cooking. She was directly from Europe-A Dane! She was a fabulous cook; as well as my grandfather of Scandanavian culture. Both were incredible cooks. They came through Elis Island and became Americans. They raised three successful children who would also be fabalous cooks. My brother and I both have cooked all our lives. Those basic recipes from Europe are so delicious. Thank you for allowing me a day to recall all those wonderful memories. I’ll cook Borscht today! 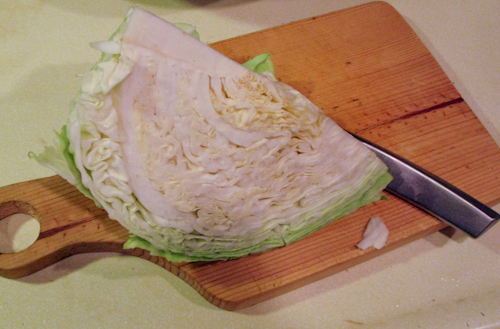 Just happen to have an extra cabbage in the frig. Happppp St. Patrick’s Day I’m one quarter Irish! Lucky me!!!!!!!!!!! !